Why not try our tasty instant noodles with extra veggies and grilled chicken? Each pack of Maggi® 3 Minute Noodles is super versatile, and so simple to make, using either the kettle or the microwave. 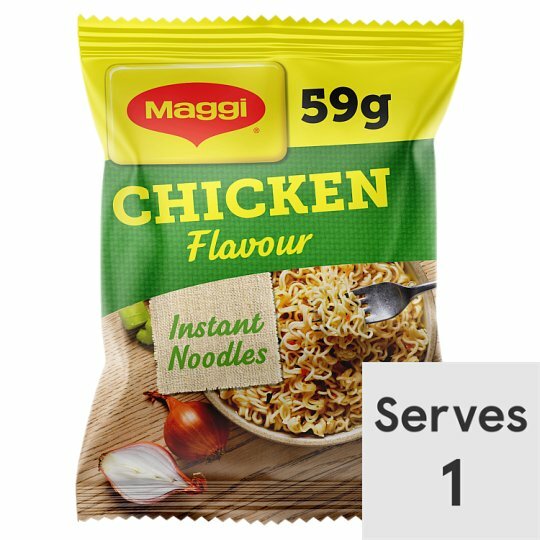 To get started, simply break your Maggi® noodles into a bowl and add the chicken flavour sachet. If you're using the kettle, boil the kettle and pour 250ml of boiling water over your noodles, before covering and leaving your noodles for 3 minutes. If you're using the microwave, pour 250ml of cold water over your noodles and heat in the microwave on high for 2 ½ minutes. It's as easy as that! If you love our Maggi® 3 Minute Noodles Chicken Flavour, why not try another flavour in our 3 Minute Noodles range, like Maggi 3 Minute Noodles BBQ Beef? Totally tasty chicken noodles; so simple to make! Cooking Instructions (General): Cooking appliances vary. These instructions are given only as a guide. Caution: Contents will be hot! Microwave (From Ambient): 1 Break noodles into bowl, add flavour sachet. 2 Pour over 250ml cold water, stir and heat in microwave oven on High for 2 1/2 min (850 watt). Other (From Ambient): 1 Break noodles into bowl, add flavour sachet. 2 Pour over 250ml boiling water, cover and leave for 3 min. Delicious as a side to your main or stir fry. Why not serve your noodles with frozen vegetables, peas or sweetcorn? For one of your five a day add 80g of vegetables per person when cooking.